Last Tuesday’s Pennsylvania Primary has come and gone, so here’s a follow up to a few of the “what to watch” highlights I previewed. Clinton and Expectations: The overall results for Clinton were excellent. She won the state by roughly 12 percentage points and over 200,000 votes out of 1.6 million cast. More importantly, she was able to meet her expectations for the election margin and was able to win many more counties than expected. While some of her best counties were the urban ones (for example a 2 to 1 margin in Philadelphia County), she was able to win all of the suburban southeastern Pennsylvania counties, most of the counties around Pittsburgh and a number of rural counties as well. In other words, not only did Clinton win big in the primary, but she won all in all the counties she will need to win the state in November. In 2012, Obama won the state by roughly 300,000 votes carrying only 13 of the state’s 67 counties: Erie, Allegheny, Centre, Dauphin, Luzerne, Lackawanna, Monroe, Northampton, Lehigh, Bucks, Montgomery, Philadelphia and Delaware. This past Tuesday, Clinton won every one of those counties except for Centre County and won a number of additional counties as well. All in all, Clinton may have effectively ended the primary with this decisive win in Pennsylvania. Trump and Momentum: As good as Pennsylvania was to Clinton last week, it was even better for Trump. While he continues to struggle with the more organizationally heavy primary tasks like state conventions, when it comes to winning Republican primaries, Trump has excelled. Last Tuesday, nationally he won all five states and all but one (Maryland) with more than 55 percent of the vote. In Pennsylvania, Trump was dominant, winning every single county and most of them with more than 50 percent of the vote. While the state’s large number of unpledged delegates may have muted his victory somewhat, his dominant performance gives him real momentum. The Wolf Effect: While most of the national focus, quite rightly, was on the presidential primary, one of the most interesting elections last week was the primary for Senate on the Democratic side. Democrats are especially optimistic about their chances of flipping the upper chamber. To do so, they will have to pick a majority of freshman senators from 2010 such as Pennsylvania’s Pat Toomey. While Toomey has made some efforts to differentiate himself from other Republicans in Congress (such as his gun control efforts), the freshman senator still has somewhat uphill odds given the Democratic tilt of the state. The race to challenge Toomey got off to an incredibly quick start with 2010 challenger and former Rep. Joe Sestak announcing his repeat candidacy very early in Toomey’s term. Sestak, who has never gotten along well with the party leadership, received two challengers: one in Katie McGinty, Tom Wolf’s former chief of staff, and Braddock Mayor John Fetterman. The party apparatus went hard for McGinty; she received endorsements from the governor, Sen. Casey, Senate Majority Leader Harry Reid and the Democratic Senatorial Campaign Committee (who also spent at least $400,000 on ads). In the end, the party’s efforts were not in vain as McGinty won, and relatively easily. She received roughly 150,000 more votes than Sestak and might have received even more had Fetterman not outperformed expectations by receiving almost 20 percent of the vote and winning Allegheny County. While Sestak did the best in some of the southeastern Pennsylvania counties around Philadelphia, those margins were nowhere near large enough to overcome McGivney’s convincing victory across the rest of the state. Now that the Governor and the Democratic Party have the candidate they want, the question remains: Can she defeat Toomey? The Tea Party and Congress: With Clinton, Trump and McGinty winning by fairly large margins, one of the last races of the night to be called was the one for Representative of the Ninth District. This large district, covering parts of twelve counties in the southwestern and southcentral parts of the state, has been held by Rep. Shuster since 2001. Shuster, who is chairman of the House Transportation Committee and connected to the leadership, faced a tough challenge in 2014 from Art Halvorson and Travis Schooley. Expecting a repeat challenge from Halvorson, Shuster was prepared for another primary race this year. The election was a competitive one, and throughout the night it was unclear who would prevail. In the end, Shuster scraped out a victory, winning by roughly one thousand votes out of more than 90,000 cast. While the margin was narrow, perhaps the most worrying part of the evening for Shuster was the fact that he lost both Blair County (his home county) and Fulton County, the two biggest counties in the district. While the incumbent has likely held on for one more term as the general election is unlikely to be competitive, the results from this race definitely lead this observer to wonder about where this leaves the incumbent for the future. On Tuesday, April 26, Pennsylvania’s voters will go to the polls to vote for Democratic and Republican nominees for president and a variety of other offices. Polls are open from 7 a.m. to 8 p.m. Voters can look up their polling place online. All registered voters affiliated with either the Democratic or Republican parties are eligible to vote. The biggest prize for both parties is the presidential race. On the Democratic side, there are 210 delegates available (with 2,383 needed for a convention majority). The number of delegates actually selected on Tuesday will be lower than that, however, as 21 delegates are superdelegates such as Gov. Tom Wolf and Sen. Bob Casey. Of the remaining 189 delegates, 127 will be allocated proportionally by congressional district with a minimum of 15 percent of the vote needed to receive delegates. Another 62 delegates will be selected by the state committee based on the results of the statewide primary vote. On the Republican side, there are 71 delegates available (with 1,237 needed for a convention majority). They will be allocated with 14 at-large, 54 by congressional district and 3 reserved for the RNC. The at-large delegates will be selected at the state committee meeting on May 21, based on the statewide vote. The congressional district delegates will be elected on the primary ballot as officially unbound. This last point is very important as it means that Pennsylvania will have a lot of delegates at the convention that could conceivably back any candidate. Below the presidential level, there are a lot of interesting races as well. On the Democratic side, there is a competitive Senate race with three main candidates involved in a spirited race to face incumbent Sen. Pat Toomey (R) in the fall. The Democrats also have a race to replace outgoing Attorney General Kathleen Kane. On the Republican side, there is a two-way competition for Attorney General. Locally, there is congressional competition as well. While the State College area — which is in the fifth district (most of north and central Pennsylvania) — does not have a contested primary, Congressman Bill Shuster from the ninth congressional district (much of south and central Pennsylvania) has a spirited challenge from Art Halvorson. What should I be watching for on Election Day? Clinton and Expectations: While Pennsylvania has not had nearly the polling that some of the early states received, Hillary Clinton has led in all or effectively all of them. This reflects strength on her side, but there is a risk. If she wins the state but in a much narrower fashion than expected, say less than 10 points, it will be easy for the Bernie Sanders campaign to spin the result as a win. And why not? She has consistently polled ahead all year (with some polls showing margins over 25 points) and the state’s demographics are generally favorable to her (an older and more diverse electorate), so for Sanders a narrow loss could be almost as good as a win. Trump and Momentum: After a bad couple of weeks, Donald Trump rebounded in New York but needs Pennsylvania and New Jersey not only to win delegates but also to avoid the perception that he is losing the nomination. While the campaign period prior to New York was likely to be a hard period for Trump regardless, he has suffered from a number of unforced errors of late, costing him delegates in Colorado, South Carolina, Wyoming as well as some of his aura of inevitability. He needs to win decisively to right the ship, so to speak, and to push his delegate lead as close to a majority as possible. Barring a major shift, he is looking unlikely to win a delegate majority outright, so he will need as many delegates as possible at the convention, and Pennsylvania can help somewhat. While he may only win a dozen or so pledged delegates on election night, the bigger the margin, the more difficult it will be for the unpledged delegates from Pennsylvania to back Cruz or some surprise candidate at the convention. The Wolf Effect: While I will definitely be looking at the presidential results, in many ways the down ballot races are more interesting. One of the biggest ones is for the U.S. Senate where there are three Democrats battling to take on one-term Sen. Pat Toomey (R). Toomey is widely seen as vulnerable, running for re-election in a state with roughly a million-registrant Democratic advantage and that has gone for Democratic presidential candidates in each of the last six elections. 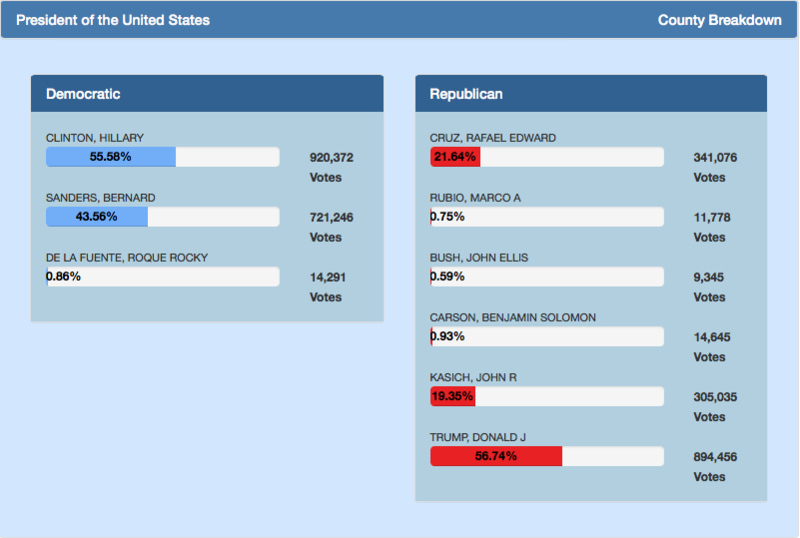 Early on, most election watchers would have said that the candidate from 2010, former Rep. Joe Sestak, was the front runner. 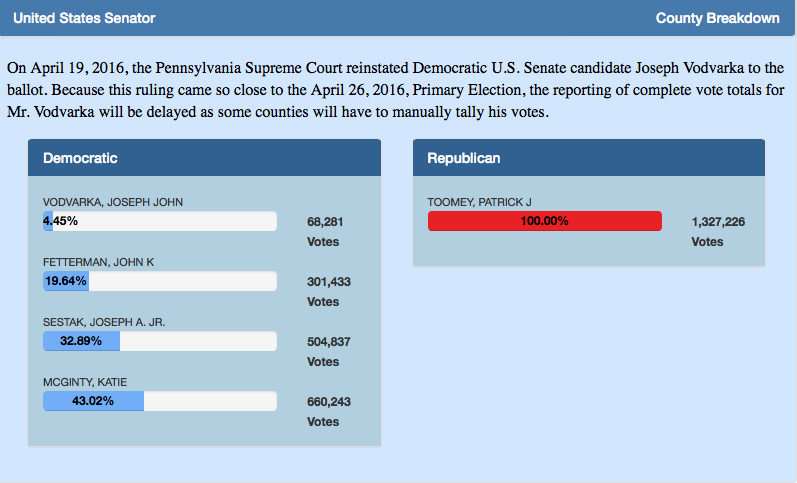 Sestak made his intention to challenge Toomey again very clear since 2010, and his narrow loss that year (less than 75,000 votes) in a very bad Democratic year reflects his strength as a candidate. That said, Sestak has not made friends in the Democratic establishment and his principal opponent — Gov. Wolf’s chief of staff, Katie McGinty — has received strong support from the governor and much of the Democratic establishment (such as President Barack Obama, Vice President Joe Biden, former Gov. Ed Rendell, and Sen. Bob Casey). Primary elections are sometimes driven by such endorsements, but most of the polling shows Sestak with a lead. Do big endorsements push a less well-known candidate over the top or does the repeat candidate get the nod despite his poor relationship with the party? The Tea Party and Congress: Compared to previous elections, this has so far been a fairly quiet year for the Tea Party insurgency in the Republican Party. While there have been some notable challenges (Texas Rep. Kevin Brady being the most interesting so far), the incumbents have generally gone on to fairly easy victories due to good planning and lots of fundraising. In central Pennsylvania, one of these insurgent candidates is challenging incumbent Rep. Bill Shuster. Rep. Shuster is a reliably conservative member of Congress, but his challenger is criticizing him for his role in the “Washington Establishment” as well as his ties to a lobbyist with business before his committee. In most elections, Shuster would be seen as having an overwhelming advantage, but this ethical issue plus Halvorson’s name recognition from his previous run might make this a closer race. All in all, it should be an entertaining election to watch. UNIVERSITY PARK, Pa. — WPSU Penn State and the McCourtney Institute for Democracy at Penn State will hold a forum for the candidates for the Pennsylvania Democratic U.S. Senate primary. This 60-minute event will be held at 8 p.m. on April 9 at the WPSU studios at Innovation Park. The forum will include all candidates polling above 5 percent in the March 24 Franklin and Marshall poll. A list of participants will be available after March 24. The forum will broadcast live on WPSU-TV, as well as WVIA-TV (Scranton), WITF-TV (Harrisburg), WQED-TV (Pittsburgh), WQLN-TV (Erie) and WLVT-TV (Bethlehem). WHYY-TV (Philadelphia) will also broadcast the event at a later date. The audience is by invitation only, but the debate will also be streamed live at wpsu.org/live. The format for the debate was developed jointly by senior scholars in the McCourtney Institute for Democracy, the production team at WPSU and Penn State students. Veteran WPSU Penn State host Patty Satalia will moderate the discussion that will focus on the concerns of college students and other young Pennsylvanians. Students will be invited to submit and ask questions of the candidates. The McCourtney Institute for Democracy is an interdisciplinary center dedicated to understanding and improving democracy through research, teaching and outreach. For more information, visit http://democracyinstitute.la.psu.edu/. WPSU Penn State is a PBS/NPR member station serving central Pennsylvania. For more information, visit http://wpsu.org/.